We are giving away a free pet tag, from our Happy Tag collection. To enter the contest post a comment on this blog, the lucky winner will be selected randomly trough random.org and announced on October 14, 2011. Please make sure to bookmark our blog so you can see if you have won. So cooool!!! My Fidel will love it! love your tags :). super cute. count me in! would love a new tag for one of my hairless doggies! we would love to win a cute new tag! Your tags are darling and my Pixie would love to wear one! Stanley needs a new tag! Love your tags and would love to win one. We love Happy Tags and would love to win another one! Love your tags!! Pls enter me! We love our Happy Tags and would love to win another! 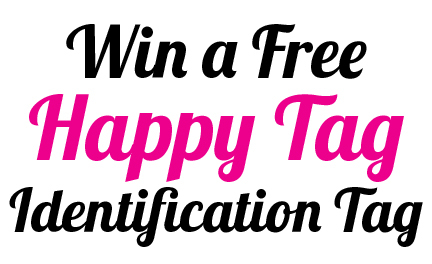 I'd love to win a happy tag! I love this flip flop design, so much fun. My pup loves her tag! I would love to win one to give as a christmas present for my parents dog so they can sport them together! One of these would look sooo cute on my dog! His name is chief (short for mischief) so great!! I love Happy Tags and would be delighted to win one for my little black dog. I want one!!!!! We already have a cupcake Happy Tags for Franny, but want to get a second one! My pup, Tango, gets so many compliments on his tag. I have referred my fellow friends to your company. Never seen any tags like these before! Way to go Happy Tags! Please enter us in the giveaway for the tag. Cheers! Seriously the cutest tag....ever. I love it. would be ultra cute on my pup! 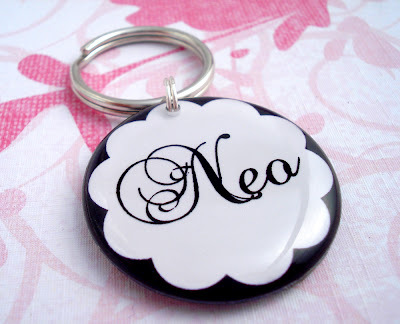 My furry kid needs a new tag, and we love these! Great giveaway! I'd love to have one of these for my cat Chester...I already have a couple saved in my Hotlist in my studio at ArtFire! Thanks for the opportunity to win one. I want one! Thank you! I enjoyed checking out all of your designs,i think the Damask Pink Heart Pet Id Tag is cute! We'd love a happy tag for our new puppy! These tags are wonderful! And I need some new tags for my puppies! We'd love to win a new tag to go with our rockin' collars! What great tags! So many cool ones it would be hard to choose! Need a dog tag. Would love this..
Wow! Great giveaway! My husky would love a new pet tag ! Like to enter contest ~ thank you! I want one!! Its my birthday Wednesday!!! I would definitely like a new Happy Tag since my puppy decided to chew up the 1st one I got :( I had to go to the pet store and just buy a generic one. I would love one of these. So would my dog! Thanks for offering this lovely giveaway! Oh my pup so need a tag! poor thing is just rocking a rabbies shot vaccine tag! Cooper is 15 years old and says he would be the 'bark of the town' if he won one of your beautiful tags! I would love to win an pet id tag for my doggy! Hi! I'd like to enter. My mom has a dog so this would be great for her ! I absolutely love these tags! I'd love to win one for one of my little ones! Tags ar gooooood! We would love one of these for our wunderboy! My dog would love a tag for her new collar! I love these! Ham and Cheese will have to duke it out to see who gets the new bling if we win! Happy tags for happy pets! Love it! I adore your tags. They are super cute! My Kumo (5-y/o Bichon) would love one! would love to have one of this for Princess and Chelsea! My 13 year old dog would love a pet tag! I love these tags! I would love to win one for either of my two boys, charlie and simon! My Shih Tzu would love one too. Please let me join. Oh my, I adore the strawberry ID tag! Thanks so much for the chance to win. That tag is super cute. Please enter me! I would get this for my friend's dog! I have the cutest dog to that needs a cute tag. Those are so cute! My dog Baudouin would love one of those! I would love to win this for a sweet doggie named Sunday! Just found your blog and your tags are gorgeous:) I'd have trouble choosing! I never been here before, I just got a mini beagle and would love id tag for him. Can i enter and win?